Every Hero Needs a Nemesis | Stavros Halvatzis Ph.D.
ONE of the chief functions of the nemesis in stories is to force the hero to evolve. Without the nemesis’ constant prodding, the hero’s effort to achieve the story goal is doomed to failure. Die Hard‘s John McClane is in a bad marriage. He is separated from his wife and is headed for divorce before Hans Gruber enters the fray, kidnaps a bunch of people, including John’s wife, and forces him to step up to the mark. By having to rescue his wife from the arch criminal’s clutches, John realises how much he truly loves her and what he has to do to save his marriage, which he does. Thank you, Hans Gruber. In The Matrix, Neo is riddled with self-doubt. Is he indeed The One? The answer remains unclear until he faces and defeats his nemesis, agent Smith. But for Smith, Neo might still be vacillating over this world-saving question. At the beginning of Casablanca, Rick Blaine is self-serving and unlikable, until he gives up on the woman he loves in order to contribute to the war effort. This is a huge shift for him. Were it not for Ilsa Lund, the opponent who turns his world upside down, he would not have grown through this sacrifice, remaining static and selfish — someone of no moral consequence. 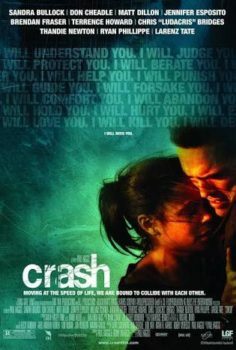 In Crash, Terrance Howard has to deal with a series of problems concerning his wife, as well as with the specter of racism. But having to overcome Matt Dillon’s constant harassment, causes him to emerges a stronger and better man. Here again, no Matt Dillon, no personal growth. Although the clash between the hero and the nemesis ostensibly occurs at the surface level, the level of actions and events, it is the effect on the hero’s inner landscape that marks its true significance. The nemesis is the hero’s polar opposite and forces change in the hero. Ironically, and unintentionally, the nemesis teaches the hero the skills and values he needs to learn in order to achieve the story goal. This entry was posted in On Character and tagged amwriting, Ian1, Nemesis, novel, novelist, screenplay, screenwriter, writetip on March 18, 2018 by Stavros Halvatzis. Very true, Gerhard! And I do agree that the Penguin, Don Falcone, and the Riddler are the best thing about the series! Good post. A Good story is largely credited to a interesting villain. It has been proven effective that the determination of the villain plays a big part in how much we care about the hero. Take Snow White and the seven dwarfs(1937) Snow white has done absolutely nothing to deserve the queens hatred . It is thanks to the queen’s determination and willingness to go to extreme measures to be the fairest in the land that we care what happens to Snow white. Also in Brave heart(1995) It is Richard the lion heated of England whose acts of brutality plant the seeds of hatred and revenge in Wallace . A good villain is perhaps the determining factor that makes you care for a hero – Gotham is significantly more entertaining then Smallville thanks to the Penguin , the Riddler and Done Falcone. That’ why most people are on team Batman appose to team Superman.